Bottle. Brown beer with a strong head. The aroma is sweetly roasted and malty, and the flavour is sweet and bitter. Overall an average beer. Reddish colour with a decent head. Taste was caramel and some Belgianish esters (apricot), overall fairly sweet. Good creamy body. Dry finish. Not bad. 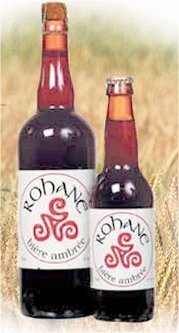 The beer I drank was called Celtika Ambrée. Same ABV - so I presume this is the same beer. If anyone knows better, please tell me. Clear chestnut red; off-white, slightly irregular head. Caramel, pie with nuts, bit of leather in the nose. Bitterish-sweet caramel and roasted malts, bit of tannines. Bitterish recedes leaving rather cloying sweet. Puff pastry. Creamy, buttery MF, well-bodied, slick. Not very edifying, this. They allways succeed better with the dark brown beers. But at least, with the Rohanne name the infection the other tasters witnessed, seems to have gone. Golden color. Plastic aroma. Sour taste; infected; dryer than the Blonde. Stop this nightmare!